Last week I wrote a blog about obedience. I think it is fair to say it had a mixed response. However, I did have some very interesting conversations on Twitter and there were some very thoughtful comments under the line, so I’ve decided to write a follow up. I’d like to explore in more detail the range (as I see it) of different strategies we can draw on as teachers beyond merely getting the students to obey. I’d consider this a very low expectation. The very minimum we can ask of our students is to come into a room with their mouths shut, sit where they are told, and do what’s required. Of course, for some students even these simple rules offer a massive challenge, both to their own status and to their relationship with authority. How we integrate these young people into the school community is a massive problem (at last count there were over 5,100 children permanently excluded from education. Where are they? What are they doing?). A common answer is, make them obey. But this seems a dead-end to me. Are we looking to turn our schools into boot camps, with ever stricter rules and harsher punishments? Where does it stop? If we exclude those that refuse to obey, where do they go? And how do they go? What have they learnt about authority and the unbending, no compromising, power of adults? What do they do next? As I say, it’s a massive problem and I’m not down-playing the challenge of having non-compliant students in your classroom, I’ve had plenty in my time. Head-bangers my dad calls them. But, what is the answer? Pandering to their whims doesn’t work, neither does forcing them to obey. We might not like it, but doing the same old things and hoping for different outcomes, is not clever. We need to start searching for new answers to these problems. Dichotomising the argument, sneering and ridiculing (which I see often on Twitter), and dismissing the ideas of those who want to think beyond the stale old strategies, is not helping. Happily, there are many in the edBlog/edTwitter community who are prepared to think differently and to strive to raise the debate above a battle between competing sides. As with many things in education, Dorothy Heathcote was ahead of her time with her thinking on how power and authority should be used in the classroom. She talked about power being something teachers hold on behalf of their students. Not over them, like a threat, but in their interests, for as long as they need it. She was not afraid to be authoritarian, learning was always the most important thing for her, but she was always looking to share her authority, and the responsibilities that came with it. She understood we can’t just thrust responsibility onto children and expect them to bear it. The transfer needs to be planned, staged, and mediated. It is a delicate process – too much responsibility, too early and the children will fail; too little responsibility, too slowly and they will learn to rely on the adults to make all the decisions. Brian Edmiston discusses this in more detail in his essays, ‘What’s My Position?’ and ‘Building Social Justice Communities’. Basically, he suggests there are three positions the teacher can take in relationship to their class: ‘Power-over’, ‘Power-with’ and ‘Power-for’. In the power-over position the teacher holds all the authority. The children are merely required to comply. In power-with the teacher positions herself as an equal partner in the use of authority, working collaboratively with the class to make decisions. In power-for the teacher gives the authority temporarily to the children and follows their lead. Each of these positions is a strategic move, used by the teacher, to develop the children’s learning and their experience of using power and having responsibility. 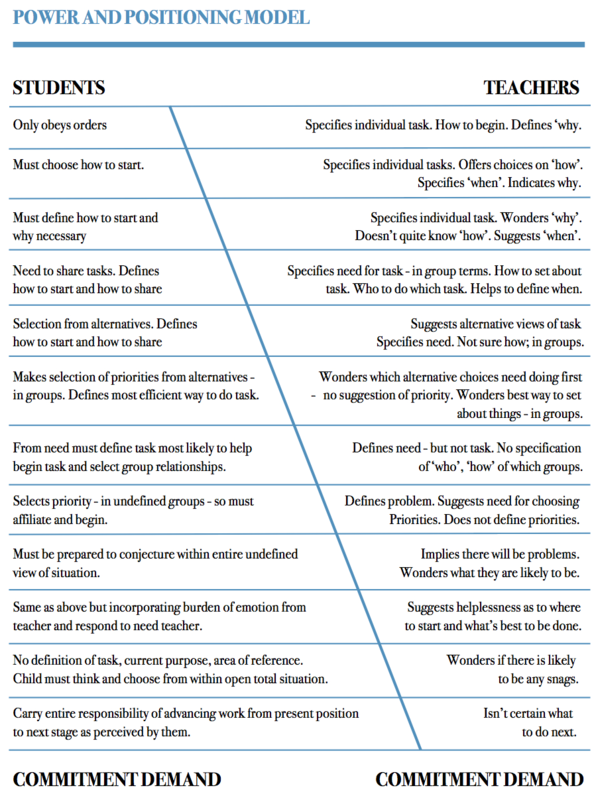 Heathcote summarised her thinking in this table. At the top the teacher has power-over the children: the teacher makes all the decisions, the children obey. As we move down the power begins to shift towards the students. By halfway the positioning is power-with, with the teacher sharing the decision-making process with the class. The power continues to shift as we move further down. By the bottom of the table the power is decisively with the students. Strategically the teacher has put them in charge, now they are the ones making the decisions and the teacher is uncertain what to do next. It would be a mistake to think this is an ethical transference of power from the adult to the children, so the children can take control. It is strategic and temporary, planned and mediated by the teacher to facilitate learning. In fact, during a session the teacher is likely to move both down and up the table, positioning themselves in relation to the class and renegotiating how power is being used as the learning develops. Of course, Heathcote was primarily interested in using imaginary contexts for learning. It is important to remember much of the experimental use of power for the children is happening in imaginary situations where people are protected if things go wrong. A good example of this transfer of decision-making happens in the Mountain Rescue context on the planning page. In this scenario there are two adults working with the class, one as a member of the team, sharing power collaboratively, (power-with); the other representing an injured climber desperately in need of the children/team’s help (power-for). Without pretending this kind of power-positioning is either easy or straight-forward, I would argue Heathcote’s table is a fantastic resource for thinking about how power and authority can be manipulated in the classroom: and then used to generate meaningful learning opportunities to help students experiment with power and develop their own understanding about collaboration and responsibility. Control freakery is born of insecurity. It is much easier to relax the discipline if you know the class won’t take advantage and impossible to do so if you know they will. Safer then to just apply max discipline all the time. It’s reflected in society in many instances of risk aversion. Easier to ban mobile phones, lock down systems to the point of being unusable and to send children home when there are a few snow flakes rather than take the risk of what might happen if we don’t. But there is loss in that too just as there is loss if every class is a riot. This is why teaching is a difficult job. There are no easy turnkey rules that apply in all contexts and optimising the balance in any particular context requires personal judgement. It’s easy to get such judgements wrong so it is easy to see in a blame culture why teachers will look for methods of self-protection whether by demanding complete unthinking obedience or allowing continuous disruption and justifying on some liberal pedagogical grounds. The most effective teaching colleagues I have known are not in either of those extreme camps. They clearly marked out the boundaries and jousted a bit around them but were confident enough to make the right pragmatic decision at the right time in the prevailing context. And when they did get it wrong the had the confidence to admit it and learnt from it. I was just reflecting on my own education back in the 60s and 70s. I think I made the most progress in mathematics when I was just left to get on with it. A lot of practice, checking what I got wrong and fixing it. I was motivated then not by the beauty of maths but the fact that the one that got the most right got out early on a Friday PM so I could do more of the stuff I was really interested in. So to me motivation makes the most significant difference and that is again very different in different individuals. To be honest, I’m not sure this moves the debate on much (well, not for me, anyway). A more fundamental investigation is to do with what we think ‘authority’ means in the context of the classroom, before we can consider what balance of authority is possible in the classroom……. This blog was my attempt to square that particular circle. Arguing obedience is not totally out of place in the classroom, but it is not an end in itself and there are other strategies (that use power in different ways) that are available to us and can be used to make learning more effective. I’m not sure why you think authority is under discussion. Don’t we all agree what authority is at least? Tim, sorry to disappoint you…..I think a few days is a long time in twitter land. I’m now wondering about the notion and understanding of authority. You mention in this blog that the teacher can step in and claim the authority back when it is necessary. In other words, the responsibility for the use of authority rests with the teacher at all times. The teacher has the responsibility to decide at any point in time how they ‘share’ the authority, but, overall they are just delegating it, not abdicating it. Obedience is an emotional word (apparently), but is an action responding to the exercise of authority. I think obedience is fluid. By the same reasoning authority is fluid in your description of it, but there is always an over layer of authority which rests with the teacher (it is part of the teacher’s responsibility). I don’t think authority impedes learning, but I also think the teacher cannot abdicate from the authority figure and be effective. Thinking about the ebb and flow of authority (or obedience)… Let’s say a teacher sets a writing task, and says to the students “Your task for this lesson is to write a story, off you go”. The students then set off writing their story. They are not being told what to write, or how to write, just that now is the time to write. The obedience required is not hugely oppressive in this example, I think. The teacher is determining the exercise of their authority. I am wondering how different your personal teacher exercising of authority is (in essence) from any other effective teacher? Hi, not disappointed, surprised. I thought I was answering your question. I think your comment makes some very interesting distinctions. Some are very subtle, but, I believe, important in this debate. First on the matter of authority. I agree entirely on your analysis. What I’m proposing is a layered approach to understanding and using authority – Levels, or concentric circles. This is something I teach my students. 1. On the outside (or at the top) is the law. We are all obligated to abide by the law. I have a duty as a teacher to keep my students safe from harm. That is the law. If a student gets hurt under my care then the police will visit the school to see me. We have no choice in this matter and if I see anything happening that threatens to break the law I will immediately intervene. 2. Next, are the rules of the school which everyone in the community is obliged to follow, adults and children, whether we like them or not. (Hopefully) they are fair rules designed to keep people safe and functioning effectively. 3.Next, are my duties as a teacher and their’s as learners. My duty is to plan activities that will help them learn. I say to them, “I can’t promise to always plan activities you will enjoy, but I promise I will never waste your time.” The students’ duties include doing their best to learn and not disrupt the learning of others. 4.Next (the level I start to use Heathcote’s table), is the level of activities in the classroom. As I see it, this is the interface between the world as it is, where laws, rules, and duties apply and the children have very little power and authority; and the world as is might be, where I can create opportunities for the children to explore and experiment with power and authority and develop an understanding of responsibility. For me, although we can experiment and explore authority in level 4, the other 3 levels never go away. They are always there, they are always higher and surrounding the authority we are experimenting with at the level 4. I recognise this is a bit convoluted, but I hope it makes sense. It is what I do in my classroom and the students understand it. I think the difference between the way I use authority and perhaps the way other teachers do (although I’m sure many others do this to) is that I make these levels explicit and open to discussion with the students. Not because they can change how authority works in levels 1-3, but so they understand how things are and that power and authority are layered and some of those layers are ones we can not change. I’ve found this is very effective. Second, on obedience. I agree obedience is not always oppressive. My argument is not that children (or adults) should not obey at all or that they should constantly question authority (that would be tedious and unworkable). My argument is that obedience is not a virtue. Not something I want my students to do uncritically, unthinkingly, and blindly. Just doing what an adult tells you them to do, because they are an adult seems (as I said above) a low expectation. I want my students to learn why and when it is appropriate to obey and why and when it is appropriate to challenge authority (hence the importance of exploring power and authority in imaginary contexts). I want my students to learn and I want them to understand how power works. And how responsibility is something you carry, not something you suffer. Again the difference is subtle, but, I believe, extremely significant. Obeying authority unquestioningly, require low level thinking and results in low level learning. Exploring authority and working with power requires high level thinking and results in high level learning. I agree that Authority and obedience are not an end in themselves, rather they are enablers to arrive at a desirable outcome. They apply in any space (country, county, school, classroom, home) where people share the space. Without them things just don’t work. Now, we always have choices with respect to when we obey, but there are consequences to not doing so. Sometimes these consequences are immediate, sometimes not. I agree that un-thinking obedience is not desirable. When to challenge authority, and how to do so, are the important considerations. Do you explicitly teach this? Overall, I think your personal position on Authority and obedience is reasonable, and doesn’t appear to advocate that the teacher is not an authority figure in the classroom. I imagine, from what you say, that all the children know that you are the person with overall responsibility for them, and are the final authority? Thanks. I think we are edging closer to agreement, at least in principle. I do teach explicitly when it is appropriate to challenge authority and when not. My particular interest is in exploring this through imaginary contexts, which can allow the children to have far more power and responsibility than they could safely have in the real world. Imaginary contexts also have the benefit of being safe environments where no one really gets hurt. Heathcote called them laboratories – where children can test out ideas and ways of dealing with difficult people and situations. I’m glad you think my position is reasonable. I’m certainly not in favour of having teachers either abdicate or handing over their authority to the children. The teacher always has to be the final authority with overall responsibility. I’m suggesting, we share that authority and responsibility occasionally and temporarily with our students for the purposes of learning and involve them in a dialogue about how power is used in communities. I wonder how much the implementation is age related….have you seen Harry Fletcher’s new post? Yes I have. Excellent. Harry and I had a Twitter conversation about it this afternoon. Personally I don’t think it is age-related, I’ve worked in this way with both teenagers and adults, as well as primary school children from R – Yr6. But I do think it is context related. Secondary schools (as Harry makes very clear) operate in a very particular way – often short 50min sessions – that require the students to come in, sit down and get started. I imagine much time can be lost in idle chat etc. Primaries, by contrast, are time-rich and often have much longer sessions. For example, I worked with a class of Reception children last week where we had the whole afternoon, nearly two hours, to work together. Furthermore, I expect most secondary school teachers teach hundreds of children during a week, as they come and go from their lessons. Whereas primary school teachers usually have the same 30 children all year. All these factors make a big difference. OK. The context matters. With respect to the exercising of authority in the context in which Harry F explained it, do you think this is consistent with the principles you have espoused here? It certainly looks pretty close. In that case, our work here is done. Next?